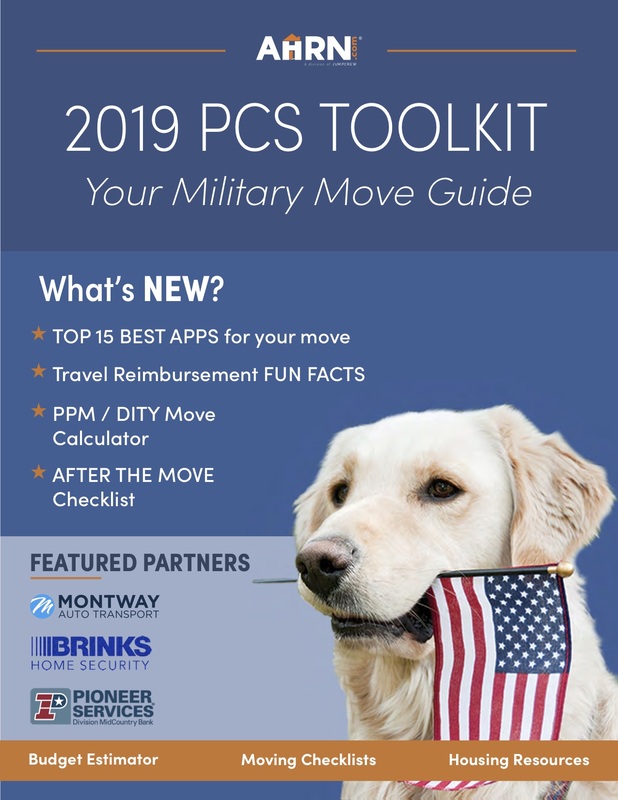 As the summer approaches, military service members and their families are receiving orders for the next PCS move every day. With those orders finally cut, it’s time to concentrate on all the details of moving your family and home to your next assignment. Here’s a plan to have you move-ready in just 8 weeks! After all the waiting that happens between when you know you are moving and when you can actually start to do something, it’s time to put your move in gear. But where do you start? If you haven’t already, now is a great time to take a half hour or so and get organized. Putting all of your papers in one place will help you many times over the course of your PCS. You could put everything in a three ring binder, using page protectors for official paperwork and dividers. You could use a small portable filing box or a file portfolio. In either case, keep all of the documents you need for your move, plus phone numbers for providers and to do lists, in one place. If you are authorized to ship a vehicle (OCONUS moves), contact your duty station’s transportation office with your vehicle’s estimated gross weight to start the process. Attend or schedule the pre-clearing brief for your installation so you know what you need to take care of ahead of time and how much time to allow for it. The timing of when you can complete the brief differs a bit on each installation, and it may be impacted if the service member is taking leave. Check the expiration dates on all of your debit and credit cards. If needed, order new ones now, to avoid worrying about mail forwarding — or cards expiring before you have an address to mail the new ones to! Complete any needed auto maintenance. You don’t want to be preparing to drive and realize that a belt is loose or your oil threateningly low. Take care of it now so that those last busy days before you head out aren’t any more stressful than they need to be. Square away your pets with a vet appointment. Update any needed vaccinations and make sure your pet is microchipped (and that the microchip information is updated and working while you are in transit). During a move is one of the most likely times that a pet will get lost. Get a full copy of your pet’s medical records to take with you. Donate or sell any unwanted items to keep your household goods underneath your weight allowance. Identify school requirements for children (if applicable). Even if you’re moving over the summer, it’s a good idea to make contact with the new school district to get an idea of any unique needs for registration and to hand carry a copy of your child’s school records with you. 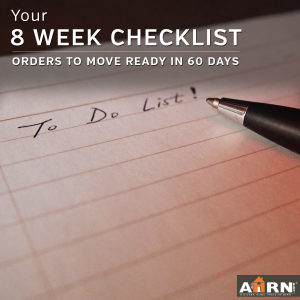 Log into AHRN.com and update your dashboard with your expected move date and your installation. Use our RentSmart tool to evaluate your housing options – on base or off – and establish a budget to make searching easier. Get a solid handle on the finances of your PCS. How will you pay to get to your new assignment? Will there be hotel stays? Will you need to pay deposits? Attend a Finance Brief to set up any needed PCS advances and get paperwork. If possible, consider getting a jump on turning in any needed equipment early so it’s out of your house before the pack out. That leaves you with one less thing to do in the last busy days plus reduces the chances of paying for an item just because it was accidentally packed with the holiday decorations! Confirm packing, pick up and delivery dates with movers/transportation office. Depending on your duty station and how busy the move season is, you may need to do this in person. Your contracted movers should contact you a week or two before your move to schedule a pre-move survey. A representative will come to your home to notate any items that require special packing material (piano, front load washers, heirlooms, large artwork) and get a solid estimate of how many people/hours/truck space will be required. If this doesn’t happen, contact your transportation office as soon as possible. Arrange for temporary lodging – on both ends of your move if you need it. If you are not able to do a door to door move, take the time now to arrange for a place to stay when you get to your new duty station. You’ll be tired and stressed when you arrive, so having already taken care of a soft place to land will be a huge relief. Begin using the contents of your freezer and pantry. Label items/boxes that you’ll want easily accessible just before and after your move. If you have your new address, submit a change of address and forward your mail. Evaluate whether you need storage options. Dispose of any leftover unwanted items or items that cannot be transported. Ensure that all insurance is up-to-date and that your insurers have a forwarding address and transit contact information. Notify utilities of your moving date and make arrangements to close out accounts. Refill prescriptions – Tricare recommends having a 90 day supply to cover any lag time in getting started with a new clinic at your next duty station. Separate Pro Gear for both the service member and spouse, if applicable. It’s about to get a little hectic. Your daily routines will be interrupted. You won’t have your stuff. There will be strangers in your house. But it’s ok, because it’s also almost over. It’s time to tie up the loose ends on your to do list. If you haven’t already, take the time to separate the important family documents that you should hand carry. A small fireproof safe is a wonderful way to protect yourself. Decide what, if anything, you will be moving yourself in your vehicles or as part of a partial-PPM. On the day of your pack out, put all of these household goods in a closet or bathroom with a “DO NOT PACK” sign on the door (after removing anything you do want packed, of course). Arrange for closing out all local accounts – gym memberships, newspaper delivery, etc. These small things can easily get lost in the shuffle and end up on your credit report! In all the craziness, support your well being! Make time for lunch or dinner with friends or to visit a favorite park. Take a few moments each day to recharge. There is enough stress already in the course of a normal PCS move – getting sick or run down will only make it worse! Along with exclusive checklists and calculation forms, the PCS Toolkit has just the set of invaluable resources from the AHRN.com blog you need as you plan and execute your PCS, and settle in at your new location! What is the most stressful part of PCSing for your family?